From the undulating sands of the Sahara, the snow capped High Atlas mountains, the hustle of the souks, rose coloured palaces and date palms - this small group tour will immerse you in the culture and heritage of this beautiful country. A country more exotic and enticing is hard to find. Morocco blends the best of Arab civilisation with an appealing climate and some of the world’s most beautiful hotels. 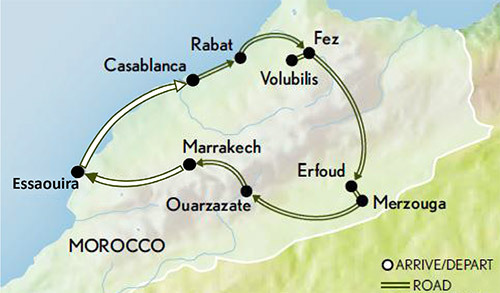 On this journey, you will take in the fascinating history of imperial Fes, the mysterious Kasbahs of the Dades Valley, stay in a luxury desert camp and enjoy the charms of Marrakech. Experience the Sahara in style when you sleep under the stars at a luxury Desert Tented Camp amid the stunning Erg Chebbi dunes. Visit Jardin Majorelle in Marrakech, a garden created by an artist and later restored by design legend Yves Saint- Laurent. People who ordered Splendours of Morocco also ordered the free travel brochures below. Click on the images to find out more about these brochures.